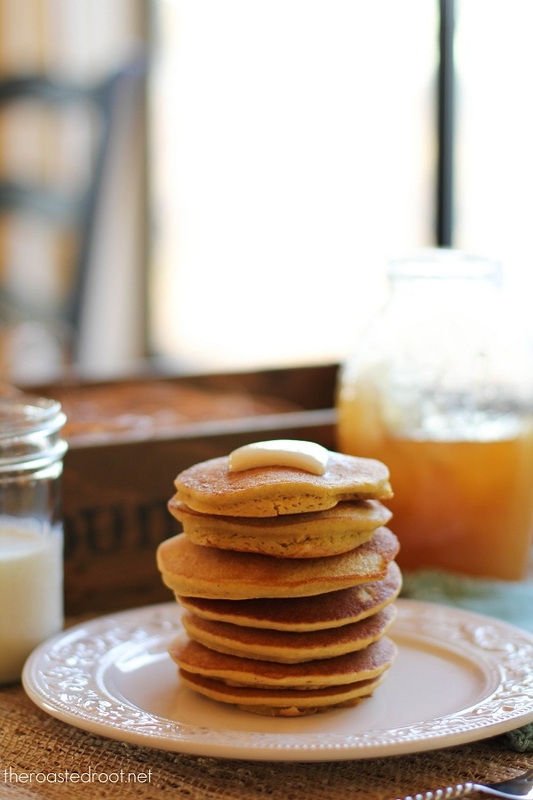 Cornbread pancakes made gluten-free with corn flour and brown rice flour. These fluffy, delicious pancakes are comforting, flavorful, and a unique take on gluten-free pancakes! Greetings and welcome to Week 5 of The Pancake Project! For those of you just joining in, Bob’s Red Mill and I have teamed up to bring you a new pancake recipe every Friday. My goal is to create fun and tasty pancake recipes using alternatives to wheat and give you something to sink your teeth into during the weekend. After eating a plate of cornbread flapjacks with butter and honey drizzled on top, I can’t help but question why every single flapjack is not made out of corn flour. Hi, commodity pancake, what a hot commodity you are! Bob’s Red Mill Corn Flour is a finer grind than corn meal, which gives the pancake the same tasty cornbread flavor but they turn out softer and fluffier than cornbread. Corn flour is the bee’s knees is what it is. It’s too soon to talk favorites but I would be hard-pressed to believe the Cornbread Flapjack wouldn’t make the top 3. They’re easy to flip, easy to eat and would make a divine ham and cheese sandwich if you want me to give it to you straight. If you make these gluten-free Cornbread Pancakes, please feel free to share a photo and tag @TheRoastedRoot on Instagram! In a mixing bowl, whisk the wet ingredients together. In a separate bowl, add the dry ingredients and stir/whisk to combine. Pour the dry ingredients into the bowl with the wet and mix until completely smooth. Heat a skillet just above medium heat and add enough oil/butter to grease it. Measure ¼ cup worth of batter and pour onto hot skillet. Allow the pancake to cook until bubbles rise to the top, 1 to 2 minutes, then flip and cook another 45 seconds on the other side. Serve with butter and honey the way you would cornbread! yes! I get so excited for friday, to see what you might have whipped up in the pancaked department. these might be my favorite, especially with the mention of bacon. yum! As a Southern girl, I am, not surprisingly, a HUGE fan of cornbread. So if you give me a cornbread pancake, I’m liable to be happy for the rest of the day. Hoping I can find some corn flour in my town so I can make these delicious looking flapjacks soon! 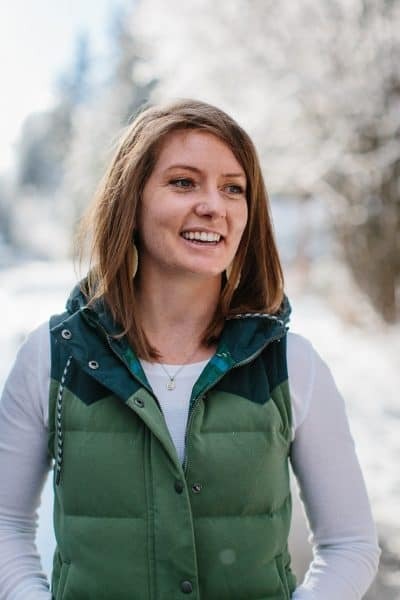 Erin… you can order the corn flour and so many other great grains, flours and beans from Bob’s Red Mill… and it will be delivered right to your door. I can also find their products at Sprouts and Natural Grocers. I hope this helps you find corn flour!!! These would be great with some blueberries. YUmm corn flour… Does it taste like cornmeal? ohhhh my! It looks like I might not have to wait til summer for some corn-lovin! These look scrumptious!! Thanks for sharing! I am so thankful to Bob’s Red Mill for directing me to your website!!! I will be making all your recipes for pancakes because they all sound delicious…. then I will work my way through your other recipes. Thanks so much!! We have just recently gone Gluten Free and I am desperate for a yummy pancake recipe that my kids will love!!!!! Lynette, as long as the kidlets like cornbread, they’ll love this pancake! Bob’s Red Mill makes so many varieties of gluten-free flours and nut meals, there’s tons of options for pancakes and baked goods. They also have a great recipe section on their website! Let me know if you try the recipe and have a great weekend!! I love Fridays on your blog! 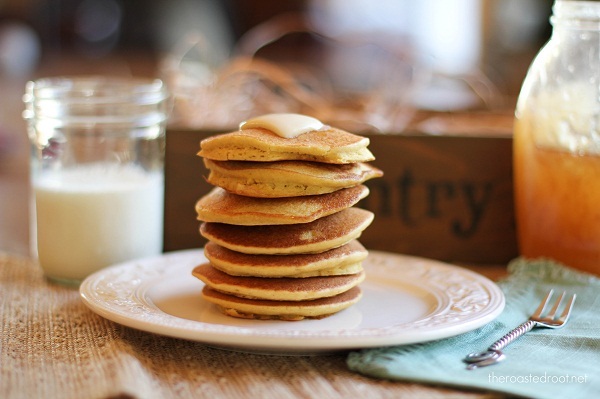 Cornbread pancakes sound amazing! Can’t wait to try these. Those pancakes look amazing! What a fun project. I love polenta and have bought several kinds (including from Bob’s Red Mill, of course), as well as corn meal, but have never thought about corn flour. They look delicious and I actually have all the ingredients already! All these pancakes look so tasty… time to go make some pancakes I think. I found your blog through Foodgawker and the pancake project. I made the buckwheat pancakes and they were delicious! Can’t wait to try these! Hmm, those pancakes look and sound delicious. Do they taste a bit like cornbread and a bit like pancakes, combined? How perfect. 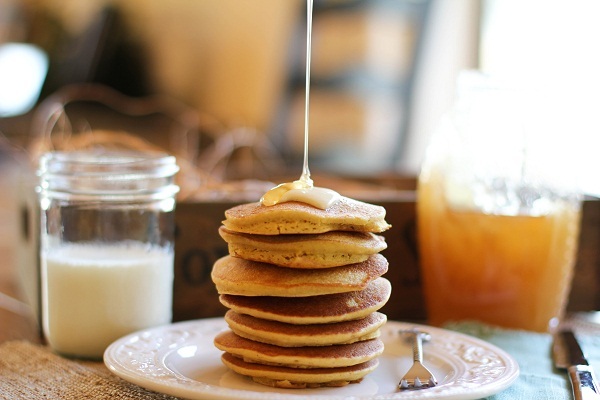 Always looking for different/new GF pancakes recipes – can’t wait to try these! I just started purchasing Bobs Red Mill and I love it ! I want to eat a cabin in pancakes. I mean, pancakes in a cabin. What? Who drinks and leaves comments on people’s blogs? Wow that’s awful. Sorry. Each Wednesday, a winner is chosen randomly (using random number generator) from the previous Friday’s giveaway and I send the winner an email. Reckon I should announce their name each Wednesday? Kinda still new to the ol giveaway thing. 🙂 Have a FABULOUS weekend! So excited to see a gluten free recipe. I am desperate to find a pancake recipe that is GF and that my kids will like ! This one, I will definitely try this week. Does anyone know if Bob’s corn meal is non GMO? What a fun twist on pancakes! I could see how a bowl of chili could go nicely along side a tall stack of these beauties. I had the best corn pancakes of my life served out of a food cart at Camden Lock Market in London a year ago, and I’ve been searching for a similar recipe ever since. I am hoping this is it. Good idea. I’ve never had cornbread pancakes. 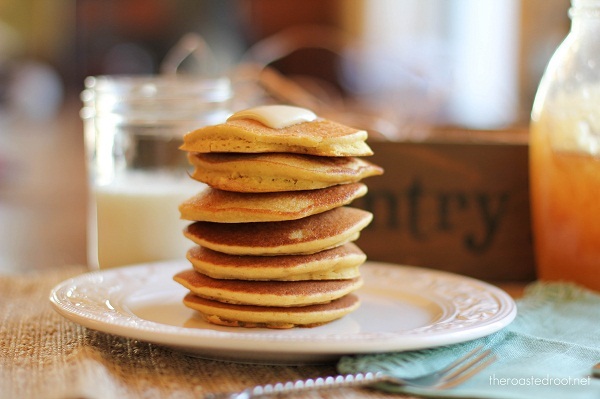 Cornbread pancakes sound SO good. They sound like they would be good for savory dishes too. 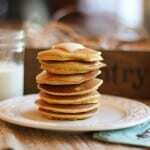 Gluten free pancakes these look yummy cant wait to make them. Thanks for the receipe. I work at a nonprofit kitchen feeding mostly high school students. I am ALWAYS looking for better, tastier ways to take care of the Gluten Free folks that come in. Excited to try this! Yum, I have been looking for a good cornmeal pancake recipe. 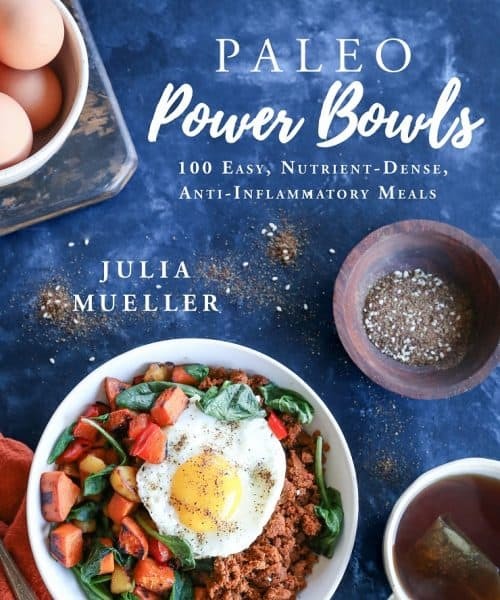 YUM – always looking for truly good GF recipes for my friend who is having a hard time adjusting to her new dietary requirements. These sound so delicious!! Would love to win and make some pancakes and cornbread! These look so good! My little girls would love them too. Stop itttttttt. Thanks to you, I’m going to have to go buy every dang BRM product in the world soon and have a pancake marathon. Kid you not. The supermarket I shopped at had a wide variety of Bob’s Red Mill products, but was unable to find corn flour. The store carried a variety of cornmeal, from fine, medium, coarse, but not corn four. I decided to try the fine cornmeal. I used coconut oil and unsweetened fresh coconut milk. Batter was quite thin, but I decided to be bold and try making waffles instead of pancakes. Four mins. later, I got waffles. They tasted good, but was gritty from the cornmeal. My husband had 4 waffles and ate it with 100% pure maple syrup. I will try this again, but may use less milk to make the batter thicker for making waffles. What is the difference in consistency with the fine cornmeal and corn flour? I was able to make six 4-inch waffles at about 172 calories pen waffles (excluding maple syrup). I read your description above, and now know the difference between corn flour and fine corn meal. I will look for corn flour now and try this recipe again. Overall, we liked it as a waffle. i wish Bob can send me some samples of corn flour. Very excited to try these! Have you tried making them without eggs? What could I use to substitute for eggs if I were to try? Two of my favorite things combined, without the gluten! I can’t wait to try these. Thanks for the feedback, Erin! I’m glad you enjoyed the pancakes! I like the let my batter sit for 10 minutes or so before I make the pancakes because it tends to thicken up after resting. So happy you made them and the strawberries sound amazing! Well, I tried being a special snowflake and used only medium cornmeal because that’s what I have on hand. I also substituted the egg with 1/4c applesauce. The batter turned out very thin, but with the oil and a nonstick pan, I didn’t need to actually grease the pan. Still, after three attempts, I wound up with more of a corn cake scramble. (Tasty, tasty corn cake scramble.) I’m saving the rest of the batter to try and doctor it tomorrow morning. I added some whole wheat flour, and now they’re perfect! Definitely going to take a few into work to have with my leftover chilli. 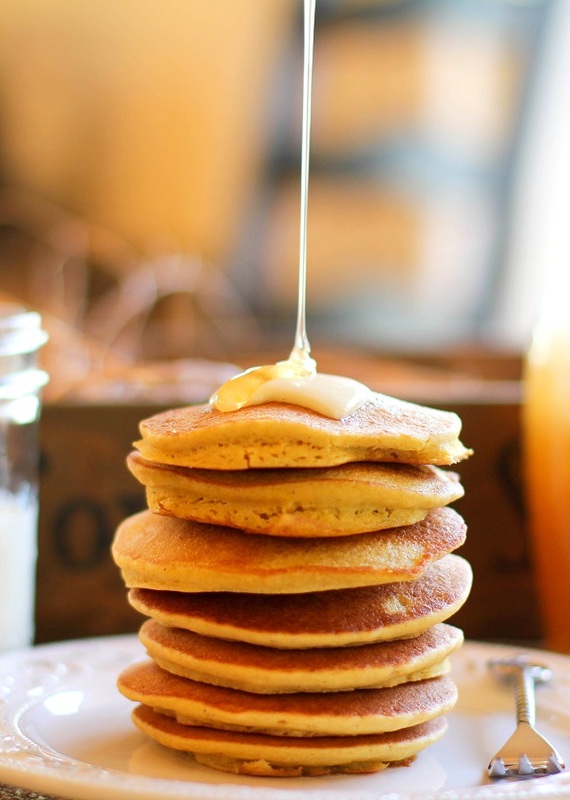 Would love to try the corn flour and use it to make some wonderful pancakes! I make my husband waffles on his days off and I am the pancake girl!